Saturday 26 October 2013, 5pm-9pm the FDC Young Designer Awards showcases some of the newest and the brightest British and International fashion designers at the Upscale, Pullman London Hotel St. Pancras 100 -110 Euston Road London England NW1 2AJ. 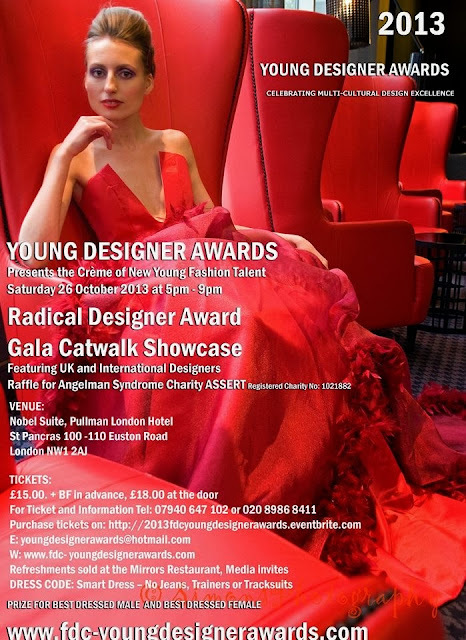 This prestigious gala show and award ceremony will be hosted by BBC Broadcast Journalist, Chaz Harrison and Laragh de Burgh, to an audience of fashionista's & media and promises to be our most exciting awards yet. The FDC Young Designer Awards will be an evening filled with music, live talent, a catwalk fashion show, singers and dancers. We will have entertainment from The Show Performance Company a world-class Can-Can troupe who caused a stir on The Alan Titchmarsh Show last week. Laura Bartlett the founding Editor of Urban Coco international who was recently featured on the BBC TV show Dragons Den. Rachel Johnson, Course Lead Fashion Design Level 3 Gloucestershire College. Akosua Annobil is the CEO of Fire Media UK and is the founder of Overground online magazine. Philippa Eyland Gentle, RCA trained Milliner and tutor at Central Saint Martins University of the Arts. Sam Davis a Director, Producer, Consultant, Fashion & Lifestyle Editor & Stylist and Creative Director of Lokation. Sarah Gresty is a practising knitwear designer, working for designers such as Kenzo, Chanel, Balenciaga and is the Pathway Leader for Fashion Knit on the BA Fashion at Central Saint Martins. Theo Omambala top international model gracing the catwalks of renowned designers such as Vivienne Westwood, Oscar de la Renta, Alexander McQueen and Dolce Gabbana and Photographed by top photographer Nick Knight; is also the Founder/ Creative Director Theo's Vision La Haute Culture. Designers involved in this years awards and gala collections showcase are: Isaac Hall-Nixon, Kate Clark, Sumneema Rai, Karen Robins, Daisy Harris-Burland, KiKa Holanda, Lindsey Tait, Erwin Michalec, Szimonetta Szabó, Chanette Laing, Taslima Khan, Kevin Grove, Anoush Waddington, Tumisola Ladega, Abbie Miriam Ivy Smith, Tracey Cochrane, Rean Fisher, Melissa Anukem, Fayola Massiah, Barbara D'Altoe and Theresa Harnois. The FDC Young Designer Awards is an exciting annual networking event that celebrates and rewards exceptional design talent, and identifies those who have the potential to break through the boundaries of creativity and become fashion leaders of the future. The awards is designed to raise awareness of multi-cultural cutting edge young designers, and is open to young people aged 9-25 years who have a passion for fashion, who have an ability to do intensive research and have a natural enthusiasm for the subject. Young fashion designers will be showing innovative garments inspired by the iconic Alexander McQueen. Radical Designers aged 21 years and over are also showcasing a collection. The prize for a winning Radical Designer is an opportunity to show a collection in Vancouver Fashion Week. Joanna Marcella says, "The FDC Young Designer Awards promises to be truly diverse ceremony and an event not to be missed, not only will attendees be privileged to witness the collections of new up and coming designers of the future, winners will be selected for a chance to showcase in Fashion Designer Expo Florida, Maryland Fashion Week or Vancouver Fashion Week. We are raising funds for (ASSERT) Angelman Syndrome Support Education & Research Trust http://www.angelmanuk.org/"
Angelman Syndrome is a neuro-genetic disorder that manifests itself in the form of severe developmental and intellectual delay and is caused by the deletion or inactivation of genes on the chromosome 15 which is maternally inherited. This rare condition affects approximately 1 in 25,000 people and is usually diagnosed between the ages of 18 months and 6 years. Irish actor Colin Farrell's son has this condition and he is a passionate campaigner and supporter for finding a cure and raising awareness about Angelman Syndrome.